Scientists say that staring at blue light emitted from displays at night can negatively affect a person’s circadian rhythm — that is, it can mess with your sleep patterns and keep you up late. Last year Apple added a feature called "Night Shift" to iOS designed to reduce the amount of blue light being projected, shifting colors to a warmer hue in the evenings that should allow our bodies to more naturally go to sleep. Now, the company is bringing the same feature to its laptops in its latest macOS update. The feature is available now as part of the first public beta for macOS Sierra 10.12.4. Those who have signed up for Apple's beta testing program can download the new build now through the Software Update mechanism in the Mac App Store — and those who haven’t but want to can simply sign up to participate. Night Shift for Mac works in similar fashion to Night Shift on iPhone and iPads, users can set custom times for the display's colors to shift or toggle the effect on manually. 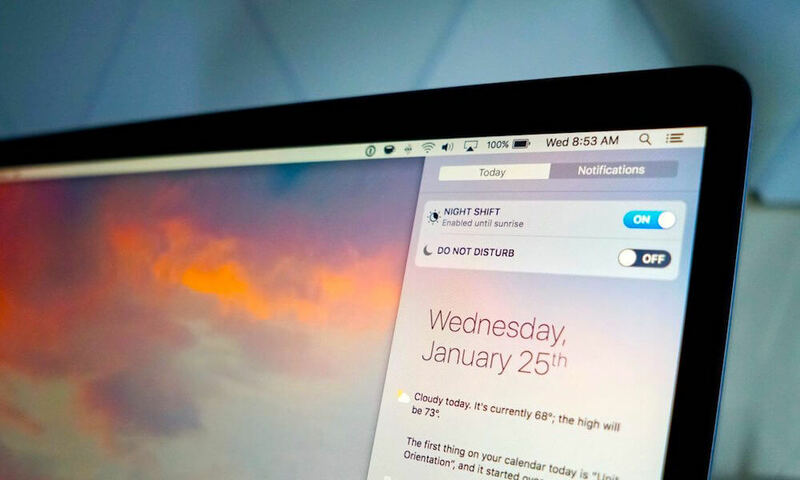 A Toggle to turn Night Shift on is available in the Notification Center and you can also ask Siri to turn it on. The night shift concept was first popularized by an app called F.lux which is currently available for Android, Windows, and Linux — it was formerly available for iOS and macOS before being removed from the App Store in mid-2016 for a supposedly unauthorized use of the iOS SDK and Xcode. Microsoft is also adding a blue light option in Windows 10 Creators Update, and a few Android handsets have the feature as well. Other changes coming in the MacOS Sierra 10.12.4 beta include dictation support for the Shanghainese language, the ability to ask Siri for cricket scores, schedules, and player information, and updated PDFKit APIs to improve how supported apps display PDFs using PDFKit.